I’ve had both real and fake trees growing up. I prefer the real but we did have a bad experience one year when we bought a real Christmas tree from Walmart and set it up all with lights and ornaments. And then the flies came……There must have been a flies nest or something in the tree cause the next day we had all these flies in our house and it was disgusting. So we had to take down the tree and get a new one! We always get our real tree on the weekend of Thanksgiving and take it down on New Years Day. Our family makes a day of it. (tomorrow actually) We will go out and pick out a Fraser Fir in the morning and then bring it home and decorate it. The kids take turns each year putting the star on top. Keep the Christams posts coming! Funny videos! @ Colleen – That sounds like some really great family memories in the making! Enjoy your day tomorrow! I’ve had both throughout my many years of Christmas seasons. I like the smell and feel of the real ones, but I like the no-needles-on-the-floor part of the artificial ones. We have an artificial one now. It didn’t come pre-lit, but we put a giant tree’s worth of lights on it the first year and have never taken them off – so I guess you could say it’s a pre-lit tree. One important (to me) tradition that I started several years ago is that I bought a life size infant doll and it goes under the tree in a “basket-full-of-rafia” manger. I tossed the clothes it came with and it is wrapped in muslin “swaddling clothes”. It’s a hands-on baby Jesus that the g-kids can play with. The gifts go on the floor on both sides of the tree, but directly under is the doll – a hands-on reminder for the little ones of what the greatest gift of all is. 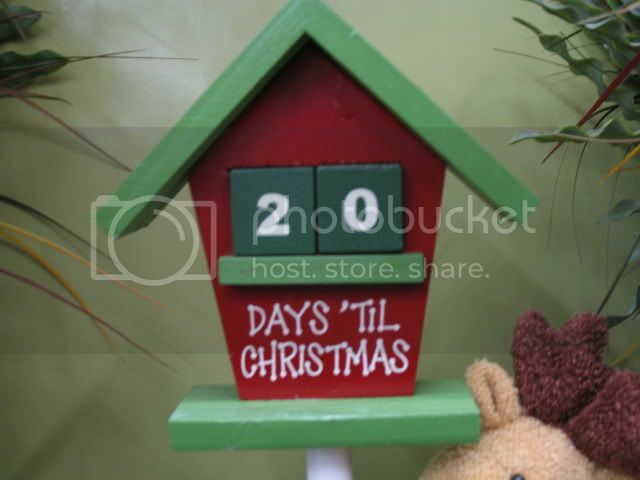 I’m really enjoying your 25-days of christmas blogs and videos – - – a great way to stay “in-touch” with family… you and Leah are so cute together!!!! Aunt Donna – I love your version of the “pre-lit tree”. That is great! Sounds like you guys have some great decorations! Thanks for the comment! Yo, we went to Devoes today to get a $35 tree and all they had were bushes…..Not trying to blow a hole in your research but that place was a downer….On the up side, got some sweet outfits for connection group christmas party….we have best dressed couple in the bag!! Really? That is a downer! haha maybe we got the last good one! Can’t wait to see your outfits! Steve is dressing up as Santa. He doesn’t have much say in it! We just got your first REAL christmas tree ever – the $18 special from Home Depot, lol. We can’t access our fake tree due to moving and the drunk that hit our house…. Both Hayley (11) & Amy (8) agree that they want to go back to a fake tree next year! Our ornaments are SO hard to hang on and keep on the tree…does anyone else have this problem??? The tree is pretty and smells nice though….thanks for the info!